When I first saw it, I thought it was just too weird. But I kept thinking about it and I just had to have one. With two kids who are growing, the trailer was too cramped, even being a D'Lite with extra room inside. My daughter will be riding a two-wheeler come spring so I knew she would be uninterested in the trailer. But for longer rides,(translate: longer than around the block) the i-go is perfect. 3) With the harness system, I feel much more comfortable with my kid on the back knowing that if either one lets go of the handles, they're not going to fall off. Which brings me to another point - the i-go allows you to start the transition out of a baby seat or trailer at a younger age. The harness holds them in comfortably while they enjoy the open ride and view. 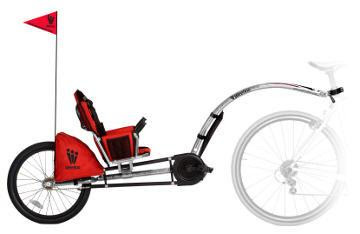 The adjustable seat on the i-go allows me to pull either kid and have their feet on the pedals so they can pedal when they want or just enjoy the ride. The enclosed drive train is something that I don't have to think about - no pinched fingers, legs, shoelaces, pants, and no greasy mess on anything at all. The kids really do have a longer attention span on the i-go than in the trailer. I can really feel it when my daughter is pedaling. The pack on the back has two pockets for mid-ride snacks and drinks. I really love this product and am convinced it is the best option on the market for kids who are too big for seats, and not big enough to keep up on longer rides. I can't wait to get another one! One "con" to keep in mind: It is extremely sturdy and solid, making it a little on the heavy side. You won't feel that while riding, but you might notice it when you're hanging it up post-ride or moving it around. Suggestion for folks purchasing one for the first time: If you intend on using it on different bikes, buy another hitch assembly. It will be easier to move from bike to bike.